My mission is to improve the teaching profession by inspiring teachers. I believe that teachers advocate for their students all day long. I advocate for the teachers, and I do so by helping them to improve their practice in ways that are practical and real. My work in the Escondido Union School District in coaching teachers on how to effectively use data to inform, guide and assess instruction, and in creating high-quality professional development, leads to effective collaboration. I believe in the importance of advocating for and supporting teachers throughout their careers, not just in the first few years. I have seen too many experienced teachers who are struggling with their classes, and are not sure where to turn. I continue my advocacy work in my travels across the country speaking with educators on a variety of educational topics, including math instruction, classroom management, understanding ethnicity and closing the achievement gap. In addition, I write a bi-monthly column for teachers of at-risk students, offering practical ideas on issues that educators face each day. I love teaching a class of 30 students; but when I teach 30 teachers who each teach 30 students, now my classroom consists of 900! Currently, I am continuing my advocacy by writing a book, collecting advice from STOYs for new STOYs as they join our family. 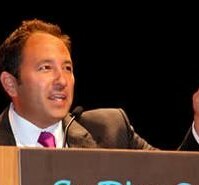 Alex Kajitani is the 2009 California Teacher of the Year, and a Top-4 Finalist for National Teacher of the Year. Known around the country as “The Rappin’ Mathematician,” his CDs and Workbooks are being used in thousands of homes and classrooms around the world. He has been featured on the CBS Evening News, and is a leading authority on providing teachers with easy-to-implement teaching strategies to help close the achievement gap. He teaches in the Escondido Union School District, and travels the country speaking with educators and parents on a variety of educational topics. Get inspired at www.AlexKajitani.com!